Love can be expressed in a multitude of ways. It’s time for a break from Latin America. Off to Polynesia. 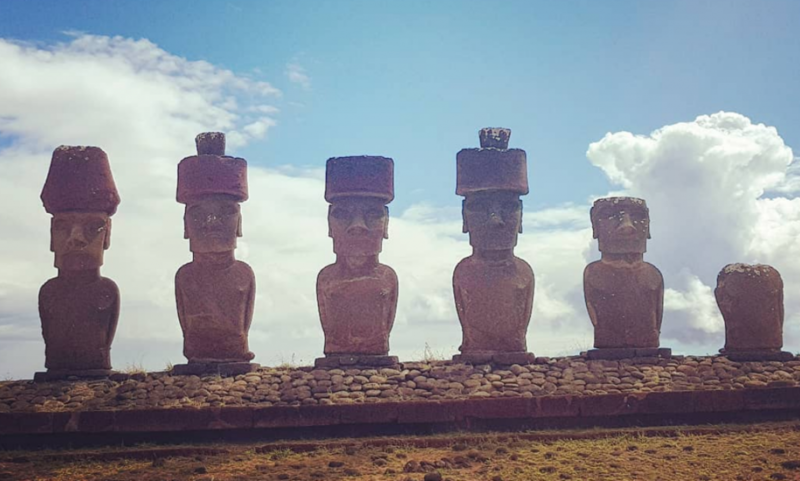 When you are leaving behind the chicas in Chile and you want to ease your way into a multi-week Polynesian stay, you go to Easter Island, the gateway from South America to Polynesia. While technically part of Chile, Easter Island is located in the South Pacific in southeast Polynesia. Unlike in the more well-known French Polynesian destinations, people on Easter Island speak Spanish. I hablo Espanol fluently, so that helps me bridge the cultural gap. My French is not the sharpest, but that languecan wait for another post. 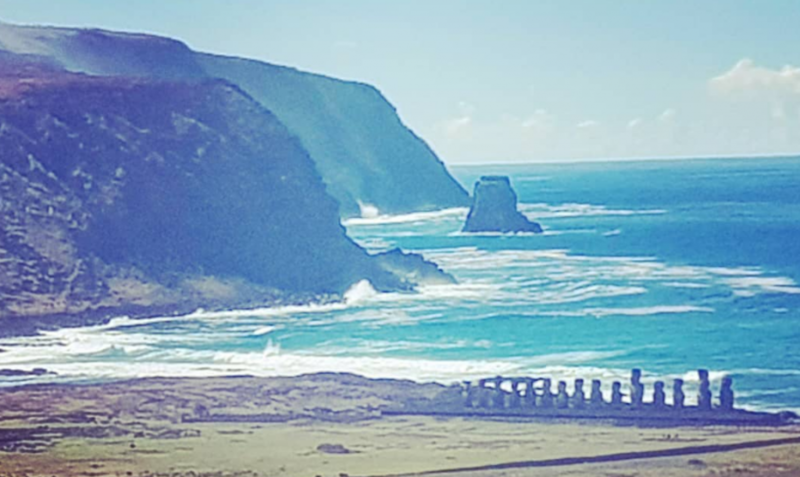 I departed Chile on the 5.5-hour flight to Easter Island, or Rapa Nui, as it is known in the local Polynesian language. When I arrived, I landed at the most remote airport in the world. Mataveri International Airport is located about 3,000 kilometers west of the South American mainland and well east of Tahiti, which is a 4.5-hour flight away. The airport also boasts an extra-long runway, as it was once designated a site for United States space shuttles to emergency land. 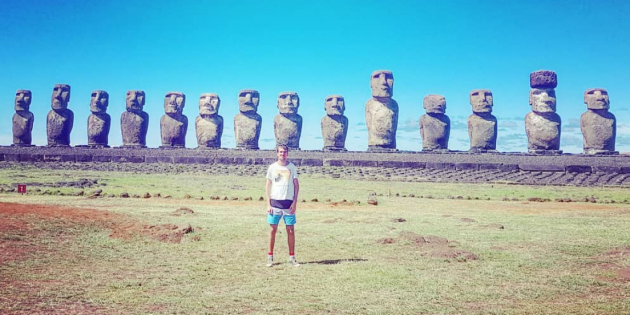 Upon landing smoothly on Rapa Nui and beginning to explore the island, it is easy to make new friends, as there are many local inhabitants just standing there waiting for you to approach them. Embarking upon my breather from my Latin American eros-making, I opted to flirt a little with the Moai. My first Moai had light brown skin with large, white, ovular eyeballs, dark irises and a wide nose with circular, puffy nostrils. She didn’t have quite the exuberance of a chica, but her emotions were totally under control as she stood stoically on a mini cliff overlooking the water with palm trees and thick greenery behind her. A pleasant little home situated above the water and between the trees could potentially serve as a romantic getaway base for me in the case that I wanted to come back seasonally and visit her. 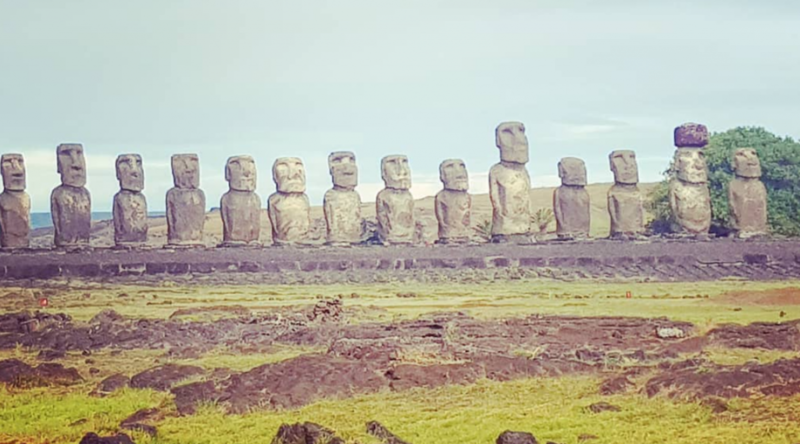 The Moai are not exactly human, since they are actually made of stone. But their carved figures and features sure look like those of humans. And unlike the chicas of Latin America, who are sometimes half my height, the Moai tend to be tall. Actually the Moais are too tall and can make me look like a dwarf. They are also very heavy. Weighing ten or more tons, it would be very difficult for me to run off with a friendly Moai and secretly stash her in my hand luggage. Actually, Easter Island is not so remote and uneventful that you need to go around expressing platonic love for giant stone men. By the way, the Moai are actually more than 500 years old — pretty impressive. Just had to note that. When craving some action on a Pacific adventure, what I do?? I climb a volcano! 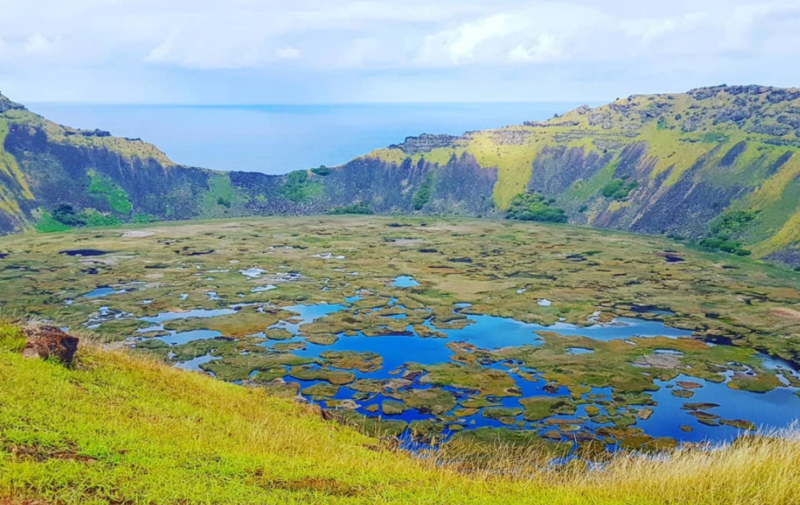 Indeed, I hiked up the extinct Rano Kau volcano, which consists of ridges surrounding a crater lake. 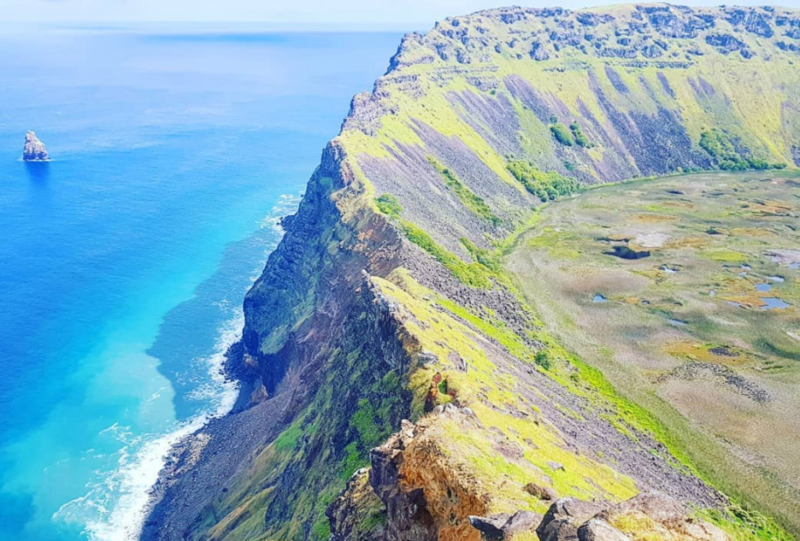 Standing on top of the volcano, looking down on the crater, as well as the ocean which is visible due to a sloped ridge, the view is well worth it. After coming down from the volcano, I continued my descent, navigating dangerous cliffs on my way to Rapa Nui beaches, which are surprisingly difficult to find and access. And once you do step foot on one of the island’s semi-hidden beaches, a new potentially fatal challenge arises… falling coconuts. I risked death by coconut as I scurried under and between coconut trees. My survival can be credited in part to the trick of listening for a cracking sound that comes before a coconut falls and then ducking and running for cover. Swimming, snorkeling — yet seeing no fish — and catching surreal sunrises rounded out my nearly weeklong stay on the island. 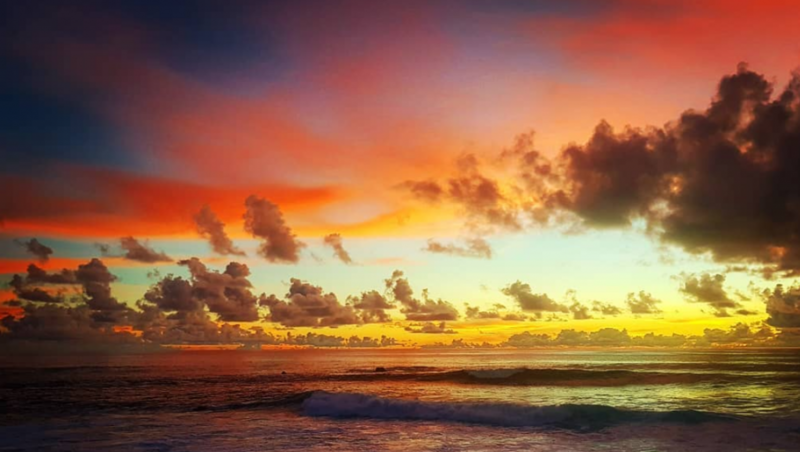 Sunrise on Easter Island really was impressive, as it featured multiple shades of yellow, orange and red mixed in with patches of blue sky and thick clouds floating just above the water. Having eased into the Polynesian style of Pacific island living, I departed Rapa Nui on the once-a-week flight to Tahiti. Digital French guidebooks in hand, I am ready to explore destinations that even make honeymooners jealous. You all can live vicariously through my photos. Stay tuned. Stay: A lovely accomodation is Cabanas Hostel Tojika. It is great value directly at the sea with unbelievable sunset views. A 20min walk from town along the sea, but also a few restaurants and a shop within 5min reach. Very hospitable owners. Eat: For a Pacific Island, Rapa Nui is blessed with a multitude of dining options. My best dinner during my week on Easter Island was prepared by restaurant Tataku Vave – which actually is the opposite direction of my hotel 10min walk. If you stay in downtown, rather take a taxi to arrive before sun sets. Drink: Chile is famous for its Pisco – so is Easter Island for mixing it with local fruits. Nothing goes over a passion fruit pisco. 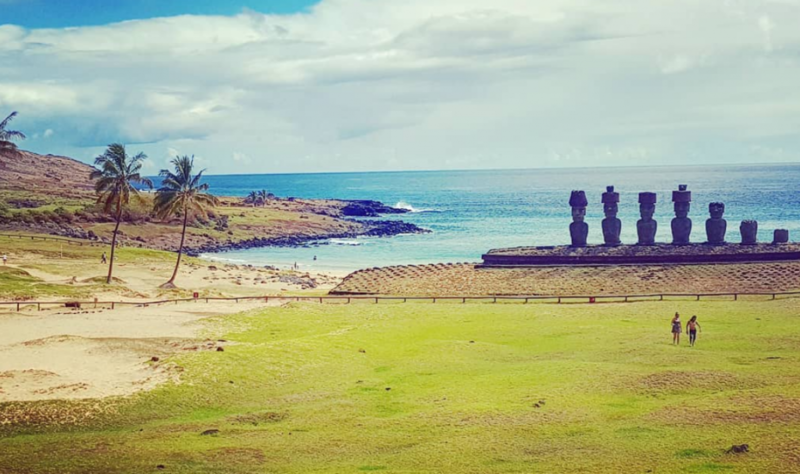 See: The moai are not everywhere, but its fun searching all along the island for them. If you are tired of them, visit the 2 volcano craters and stunning Anakena beach. Do: Go diving or snorkeling along one of the motus. Easter Island actually has not many fish, but the water is incredibly clear and visibility often up to 100m down. Connect: Mobile internet was just usable in Hanga Roa downtown. Apparently, the most expensive hotel on Easter Island has a exclusive contract for all the internet volume whereas everyone else has issues. Go next: Most people come from and return to mainland Chile. 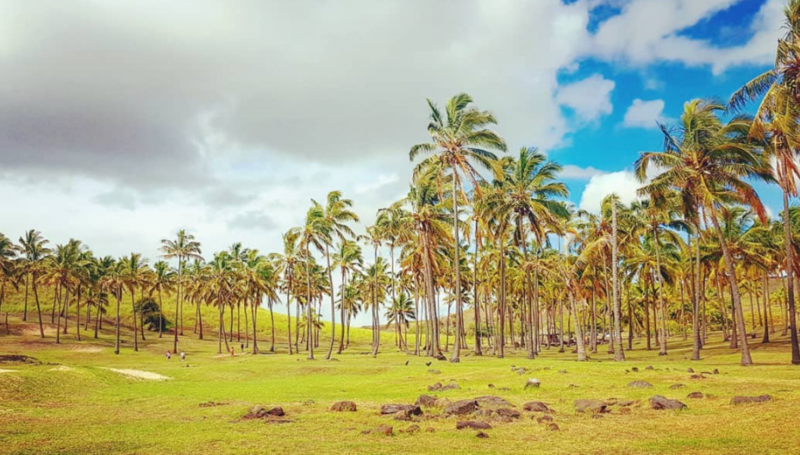 However, every Tuesday you can fly westwards to the beautiful Tahitian islands and either connect further or discover French Polynesia.